Blog reader Brian Kennedy began a comment – written in April, 2013 – with an apology for arriving late to the discussion on “fallibility.” It is now my turn to apologize. I started my reply several times but failed to meet self-imposed standards for clarity. My reply is spread over several entries done to preserve the blog-format which insists on short communications! Each reply is separately titled. Facts and their properties have occupied my thinking for much of the past year. I have suggested that our current term *fact* needs to be supplemented by terms that express the idea that many facts have lost their credentials and have been dishonourably discharged: what these assert no longer is so. 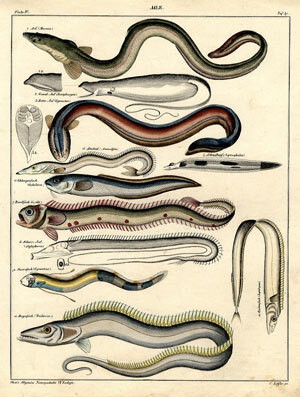 A famous case is the discovery (c.1886) that eels have sexual organs, i.e., reproduce in the “normal” manner! The discovery was consonant with Darwin’s view that fish reproduced sexually and were not worms reproducing through “spontaneous generation,” a view advocated by Aristotle two thousand years earlier. This discovery meant that statements supporting spontaneous generation as a mechanism for generating new life forms were considerably weakened to the point of extinction; these now joined the ranks of “factoids,” a part of dead science. In short, spontaneous generation was not an option to account for the emergence of new species. One-up for Darwin’s wild speculations? Here then is a model for the transition of statements which describe the world in empirically false terms and how a new body of knowledge takes over. It wasn’t that the new theory was correct, but that the old one was faulty. Let’s not overlook that spontaneous generation was a plausible theory at the time – but in the end it was inadequate and rejected. Time to open a new bottle? In summary, the challenge faced by biologists at the turn of the 19th century was to discover evidence which either supported an older theory of speciation (sanctified by Aristotle) or to find evidence which contradicted a theory proposed by Darwin and others, that speciation was an ongoing process powered by a combination of mutations in cells (about which very little was known) and the adaptation of such mutants to their ecological niche. These were different but complementary tasks: find supporting evidence for two conflicting positions about speciation and/or find evidence which contradicts one, or both, of the theories advanced to explain the large variety of species found and the source of their often small inter-species differences. At the time these matters were debated microbiology and especially cell biology was in its infancy, half a century away from the great breakthroughs in the late 1950s. The initial problems were set by conflicting theories formulated during a time of inadequate, sketchy knowledge. We have here a case-history demonstrating how these problems were approached and resolved, step by step, through empirical investigations. But the history of our knowledge about the world also records many cases where solution were adopted by ex-cathedra means, that is by declaring a solution to a problem which was based on arguments from first principles. If there was disagreement it was based on how well deductions had been made from the assumptions adopted. First principles are assumption which are not themselves directly challenged, but are assumed to depict a state of affairs either on the grounds of self-evidence, or because they appeared the best ones – the most rational – under the circumstances. The most persuasive case of solutions reached in this manner is given by the proofs of Euclidean geometry, which assume that space is best represented by a one-dimensional linear surface. All the conclusions reached by Euclid and his successors hold when applied to what is basically a “flat earth” model: the conclusions do not hold for concave or convex surfaces, i.e., not for globes. The assumptions that the earth is flat, that the earth is stationary, that celestial objects move relative to the earth, that the movement of celestial bodies are uninfluenced by their proximity to the earth, that light and sound travel through a medium and specifically that light travels in a straight trajectory etc. were not questioned until much later. When these assumptions were challenged one by one, exposed to experimental investigations, it also marked the end of solutions to problems using the ex-cathedra approach. Of course deductions from first principles were valid when done strictly according to the rules, but the deductions themselves could not answer questions about what was in the universe to start with and how things worked in the “post-creation” period! Such questions demanded empirical solutions, the use of investigative methods. Once it was accepted that empirical investigations could reveal new facts it opened the door to the (dangerous) idea that old facts could be tarnished, even faulted, that new discoveries could be superior in some degree to old facts. To which old facts? All or only some? Those facts declared to be so by the first layer of assumptions made? A dangerous idea. The history of comets is a case in point. Comets had been reported for thousands of years by both Eastern and Western sky-watchers, but were thought to be aberrations from a pre-ordained order of things,that portended unusual events, like the birth and death of prominent people, (e.g., Caesar’s death, Macbeth’s kingship, Caliban’s fate – Shakespeare was well versed in the Occult), or generally boded good or ill. But where did comets come from, and how did they travel in the sky? This was a specially difficult problems to answer if one assumed – as was common for thousands of years – that celestial bodies travelled around the earth on fixed translucent platforms, perhaps on impenetrable glass discs, each “nailed” permanently to a wall in the sky. There were other assumptions involved, layered at a different, more basic levels, for example the assumption that whoever created the world (the great mover, as assumed by some early Greek philosophers) this god must have created everything according to a perfect plan, using perfect forms e.g. perfect geometric forms and patterns. Such assumptions had to be jettisoned before one could consider alternatives which dispensed with the notion that (a) there were perfect forms, (b) the creator had to use or was likely to use perfect forms in constructing the world from nothing or very plastic raw material, (c) anything imperfect had to be an illusion, a distortion, aberration and therefore was unnatural! Comets, according to ancient astrolomer/astronomers, priests, and others, were not natural phenomena at all, but a species of divine interventions in the normal, divine order of things. Divine aberrations. The last few paragraphs illustrate quite graphically what I have tagged as ex-cathedra procedures, and demonstrate how a naturalistic philosophy (based on the assumption that knowledge by empirical discovery is superior to knowledge derived from first principles) works. The issues have been debated by metaphysicians for two and half thousand years, a period for which we have far from complete records. But I suspect that it is not debate alone that is decisive. As our understanding deepens through debate, we have to remember that, underlying these, we see sizeable shifts in the way we see matters as a whole. Problems once vigorously debated have a history of passing into history and in current terms get exhaustively archived “in the cloud.” Future generation can read all about them, but we in the present can only speculate what such solutions will look like. The past is not a good guide to the future.